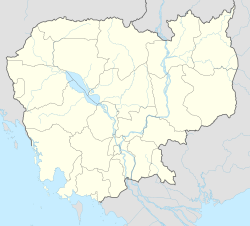 Krong Ta Khmau (Khmer: ក្រុងតាខ្មៅ, literally: "Black Grandfather") is the capital and largest city of Kandal Province in central Cambodia. The city is about 11 km (7 Miles) south of Phnom Penh (directly borders of Phnom Penh). Approximately 60% of the citizens of Krong Ta Khmau travel to work in Phnom Penh. Ta Khmau is divides into 10 communes. Below are list of some institutions in Ta Khmau. This page was last edited on 3 March 2019, at 06:53 (UTC).